J: Well, it all began this season with a trip organized by Rob at Orvis NYC. We left Saturday am to meet the rest of the group at the local fly fishing shop -Border Water Outfitters- in Hancock. Men, what a swinging town Hancock is! We were briefly introduced to the group of anglers who signed up and to our guide "du jour" Ray and off we went. We drove to Balls Eddy and got the boat in the water. It wasn't so busy and sure was a beautiful day! Hyun and I had been there the year before but storms had practically made it impossible for us to fish from the shore. This time we were doing a floating trip. So, off on the west branch we were. We began to float and cast our lines. To my surprise I feel pretty good and wasn't casting so badly. It had been after all 6 months since my last cast! After floating maybe a few hundred feet, Ray started to row up the river to go back to our starting point, which I thought a bit strange, and then we did it again. Once we floated a couple of hundred feet, Ray started to row back up river. At this point Hyun and I were reading each others minds...What on earth is Ray doing?? When we were about to go up river to our starting point for a 3rd time, Hyun asked Ray why we were going back for a 3rd time? I must admit I was going to ask him myself, since there wasn't anything spectacular to look at, no fish seemed interested in our fly, and oh yes my friends we were nymphing, so double bummer! Anyway Ray explained to us that he had chosen the shortest part of the river and if we did not make enough stops we would be at our finish line in no time! Well, we did not care to go back up for a 3rd time so we told Ray to let us float down the river, not up, from now on! The day did not spoil us with a multitude of fish. I caught a sardine sized brown that "snooty" Hyun frowned upon (if it is not over 20 inches Hyun doesn't bother counting them as a good catch or a catch at all : )) I, on the other hand was ecstatic! Around mid-day, we thought our luck had changed when Hyun hooked what seemed like a small shark, it was seriously big and feisty and oh yeah it was a beautiful rainbow. He got away (we were still nymphing). We could not believe it, we were so bummed. It was huge and all of a sudden the creature itself jumped out of the water entirely, I'm assuming to show us who had won the wrestling match! Well, it was he who had won. It was 22+ in size, magnificent fish he was. Oh well. C'est la vie! It was sure thrilling for a minute or 2. Towards the end of the day, Ray anchored us down to where he thought we would experience spectacular rises. Indeed, there was some action but the real action came from behind our boat where a couple of very angry and territorial beavers were trying, with success, to distract and to exasperate us with their tail flapping. They were not happy campers! We finally left them in peace to enjoy their beach front property alone, family style. The rest of the evening went by and by and we went back to the hotel. 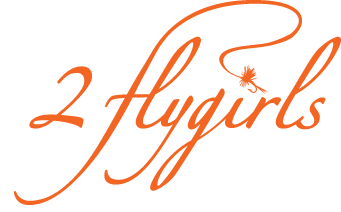 H: It was great being back on the water with my flygirl Josée, and she did really well for her first day back. Honestly though, I expected more from the float trip organized by Orvis, NYC and Border Water Outfitters. That morning, I asked our guide, Ray Ottulich, about current conditions on the different branches of the Delaware and which one he recommended we float. Without hesitation he said "we're floating the West Branch". Turns out Ray does not have a park license to float the Main stem and he told us he rarely ever floats the East. He had no information on the other branches—what the conditions were like or how they were fishing. So, that left us with our only option, the West Branch. Fortunately, the Delaware escaped the brunt of a major storm system so all the branches, including the West, were in decent shape. But the fact that we had no choice was a disappointment and surprise. Besides almost landing a monster brown trout that took me into my backing (first time that's ever happened, but hopefully, not the last! : ), the highlight was anchoring the boat in the middle of some lovely, mirror-glass water just before dark, trying to cast a perfect, drift free fly over some sporadically rising fish, despite the antics of 2 very loud, territorial beavers behind us. We spent the next afternoon with Richard on the East Branch. The fishing was slow but it was a beautiful summer-like day and we were blessed to see 3 bald eagles soaring above the river and treetops. I gave Josée a brief double-haul lesson (trying to pass on some casting wisdom recently acquired from the Master Caster). We lazily observed orioles, yellow warblers, red-breasted blackbirds, and hummingbirds while sipping delicious Spanish rioja on Richard's porch. Richard was feeling under the weather but still the perfect host. It was a wonderfully relaxing day.